Vulture visits the set-building factory for Saturday Night Live. Check out some great photographs and insights into how Eugene Lee and his team of designers create sets from scratch in only a day or two. Tested visits the Jim Henson Creature Shop and gives us this great sixteen minute video. What I love about the Creature Shop (other than how awesome their puppets are) is how Jim Henson started out with simple hand puppets in the mid-50s, and today the company is on the leading-edge of animatronic creature design. Rania Peet has some great projects over on her Instructables page, where she shows off the work she does as a Halloween haunt builder. I particularly like this chasing marquee “Freak Show” sign and these giant mushrooms. If you love getting obsessive over the details on your paper props, check out the Passport Stamps and Visas group on Flickr. It’s chock full of interior pages of passports from around the world, as well as a few exterior covers as well. 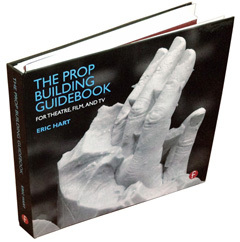 Chris Ubick has been the props master on dozens of films, such as The Help, Practical Magic, Milk, and The Internship. Dianne Reber Hart has written a great article on her life and career which you should check out. This article is a few years old, but worth mentioning: The Last Electronics Project I Completed. It’s a little deep and heavy at times (the author was building a fake bomb prop in lower Manhattan in early September of 2001) but it brings up some questions about the questionable legality of what we sometimes find ourselves building. On a lighter note, here is how to force a patina on carbon steel. Short answer? Shove it in a lemon. And finally, here is an interesting Instructable on assembling a vacuum-formed model. 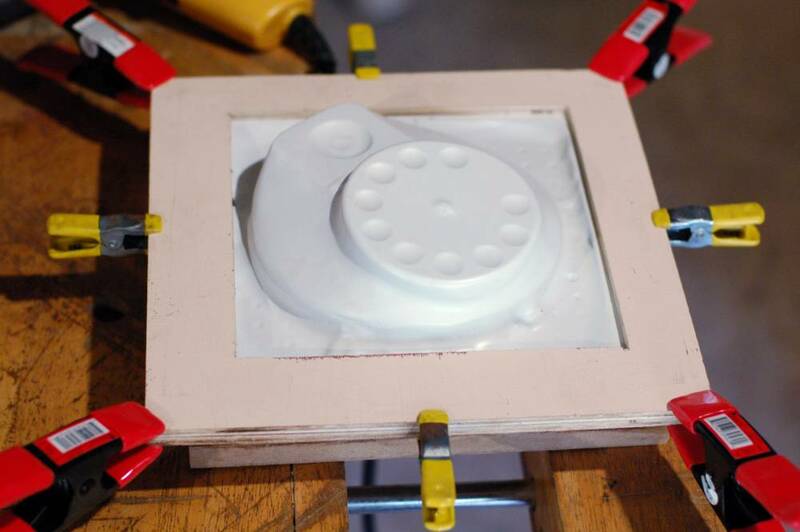 If you have tried vacuum-forming before, you will know that making the parts on the machine is just the beginning. You still have to trim, assemble and reinforce the parts to get a usable prop. This Instructable steps through some of those processes to make a fake ammo drum. I am currently working as props master on Crazy for You at Elon University. In one of the musical numbers, twelve showgirls dance around the main character while talking on the phone. The show is set in the early 1930s, so that is twelve candlestick phones needed (all of them painted pink). If you’ve ever had to get candlestick phones, you know that the real ones are prohibitively expensive, and even the replicas are too expensive when twelve are needed. I decided I would make them all (which is what most theatres do). Most hand-built candlestick phones I’ve seen have a pretty simple base, and I wanted to try for something a bit more interesting and realistic. Since these were just being used during a dance number, the dial didn’t need to work. It looked like I could sculpt the base as a solid object and than just vacuum form twelve copies. The only problem? I don’t have a vacuum forming machine. I ended up assembling a very small and fairly weak vacuum forming system out of tools I already had and scrap materials which were laying around. Other than my time, the cost was free. I was able to make all the phone bases I needed though the process was a bit inelegant at times. I like what vacuum forming can accomplish, and I think I may spend some more time (and maybe even some money) making a more usable vacuum former after this show opens, but it was nice to be up and running without too much investment on my part. 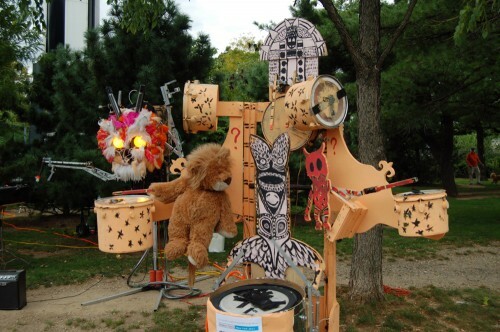 This past weekend in New York City I attended the second annual World Maker Faire. 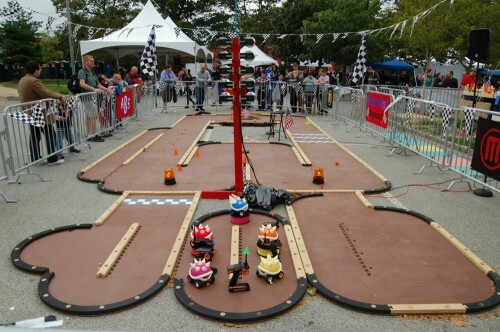 Readers of this blog may recall I attended the Maker Faire in 2010 as well. If you read Make Zine or follow their blog, you can guess what the fair is like: a strange mix of science fair plus craft fair, with a Burning Man—vibe thrown in. I headed to the Instructables booth because they were giving prizes to their authors, of which I am one. If you don’t know Instructables, take a moment to check it out; it’s usually one of the first places I visit when I need to figure out how to make something or work with a new material. General Electric tweeted me while I was there, which was kind of strange. Maybe it’s because I talk to light bulbs. 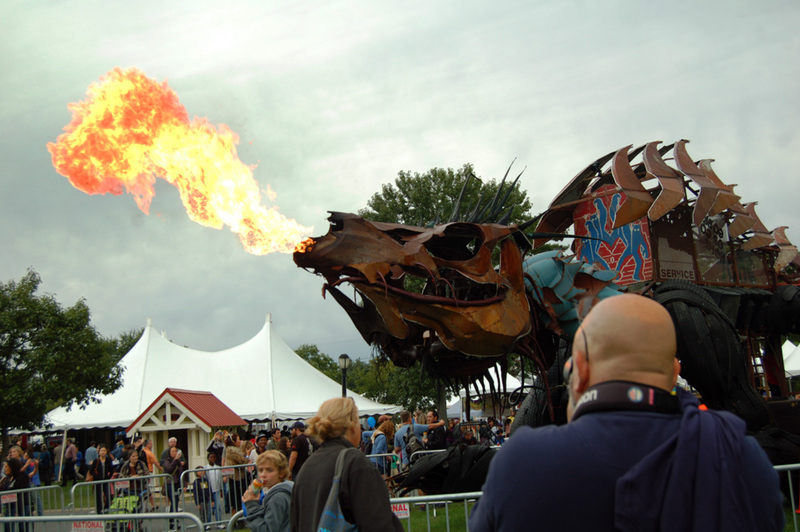 The 60-foot long fire-breathing dragon constructed of scrap materials was quite a sight to behold. Check out the video detailing its construction and the story behind it. Speaking of videos, I meant to get a video of Arc Attack, who I missed last year. My phone kept crashing, but you can find plenty of videos online. It’s pretty breathtaking to watch in person. 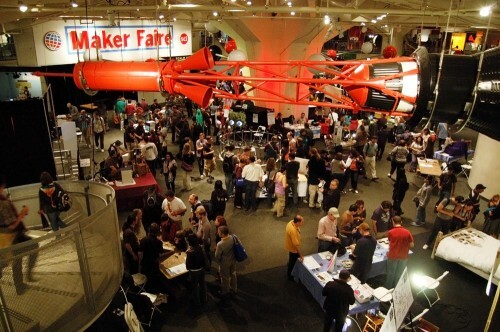 The Faire certainly steers towards the science and technology side of making, with lots of circuit projects, computer-controlled devices and engineering solutions. Still, a props person can find a lot to keep occupied while here. 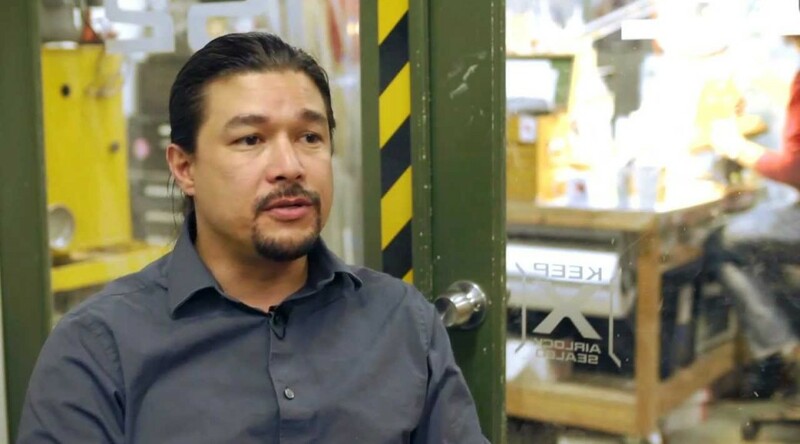 Companies like Smooth-On, Autodesk and ShopBot were there, as well as organizations such as Materials for the Arts, many of which are familiar faces to those of us who work in props. It’s always fascinating to see what people with similar interests and skills are doing outside of the entertainment industry.